Hi Guys, Today we are going with Steps for File Based MDS configurations. 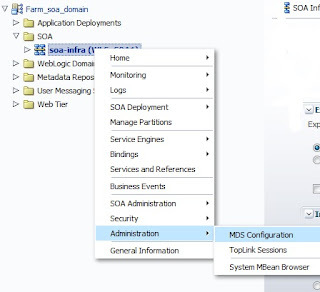 Login to EM console.Expand SOA and right click on soa-infra and selcet Adminstration -->MDS configuration. All your project related WSDlS,XSD,fault-policy.xml,fault-binding.xml etc will be inside the apps folder. Now go to your C:\Oracle\Middleware\jdeveloper\integration\seed folder in your system, or it could be any other location as well, based on your Installation directory. The above path created automatically while you installed JDeveloper studio. Copy and Paste apps folder, which you have got in from STEP 2. To use these schemas/wsdl etc in Jdeveloper we need to add some parameters in adf-config.xml under Application Resources. Note:For each and every application it has his own adf-config.xml file persist. 1. 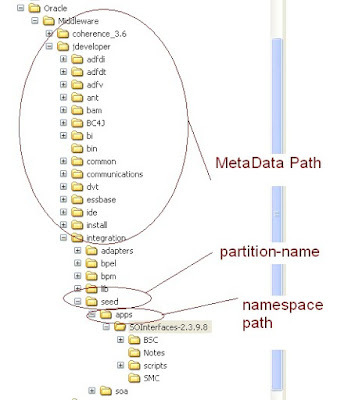 I have specify mstore_usage_2 path="/apps"-------because my all schemas under that folder only.Incase ur schemas under apps folder only u can specify path like path="/apps"
3.Patition-name valuse must be seed in real time scenarios. To use a wsdl or any resource in your project use below reference.